Students will be able to calculate the area of isosceles triangles without directly measuring the height. 1. Teachers should construct a model of an isosceles triangle. Two sides of this triangle should be built using two 24” Toobeez tubes. 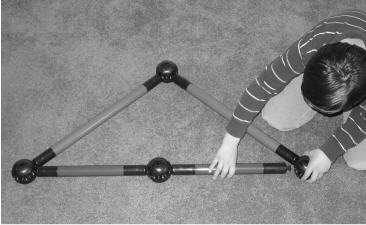 The third side should consist of two 16” Toobeez tubes with a sphere in the center connecting to the other two tubes in a triangular arrangement. 1. The class should be led in a discussion to determine the unique qualities of the model. Teacher Note: Students should realize that two sides of the triangle are equal in length. 2. After the class arrives at the appropriate observations, teachers should present the definition of an isosceles triangle on the board. Students should copy this definition in their notebooks. 3. Ask the class to recall any math strategies used in studying triangles. Teacher Note: The desired answer is the Pythagorean theorem. If this has not previously been studied, precede this lesson with Activity #2 “Pythagorean Puzzler,” which offers an excellent introduction. 4. After the class recalls the Pythagorean theorem, ask the class whether that theorem can be directly applied to the model of the isosceles triangle. Teacher Note: Students should realize the model is not a right triangle and the Pythagorean theorem does not apply. 6. Ask the class the strategy for determining the base length. 7. After students realize the base can be directly measured, have a volunteer measure the model’s base length with a meter stick and report the result to the class. 8. Ask the class: “Can any side of this model be measured to determine the height of the triangle?” Allow a discussion so ideas can be introduced. 9. Once it is agreed upon that no side can be directly measured to determine height, the teacher should insert a 16” Toobeez tube extending from the center sphere of the base to the sphere at the apex of the triangle. Challenge: Students will be able to calculate the area of isosceles triangles without directly measuring the height. 3. Teachers should instruct students that the same area value arrived at in the setup can be attained without measuring the height. 4. As an introductory y clue, groups should be instructed to try and use the Pythagorean equation to solve their problem. Allow the groups ample time to arrive at a solution. 5. In the event that no group offers a solution, present the strategy on the board by slowly introducing individual steps and providing time between each step for the groups to brainstorm. Demonstrate the Toobeez model and assign it the variable h for height. Point out that two right triangles have been created by this tube. Additionally, point out that the base, represented by a,has been divided in half by h tube. Each half can be represented by 1J2a. The hypotenuse, represented by c, remains unchanged. Finally, move to the”Activity Discussion and Processing” section of the activity. Have students draw non-right isosceles triangles and determine the area by direct measurement and solving for the value of h. Compare your results. Ask the students to explain why the Pythagorean theorem cannot be directly applied to determine side length in isosceles triangles. What makes a triangle isosceles? What ot her features, besides two equivalent sides,define an isosceles triangle? How did this activity require you to demonstrate trust and test your communication skills? Have the students draw various isosceles triangles and measure the angles. Ask them to determine additional qualities ofthe isosceles triangle. Provide students with the height and base length of an isosceles triangle. Have the students solve for the length of the two additional sides of the triangle.